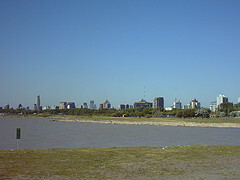 Vicente Lopez is a district made up of the following neighborhoods: Vicente Lopez, Villa Martelli, Florida, Florida Oeste (West Florida), Munro, Olivos, La Lucila, Carapachay, and Villa Adelina. Vicente Lopez is located in Northern Greater Buenos Aires, 16 km away from the City of Buenos Aires. The area was delimited in 1905 on territory belonging to the district of San Isidro. To the South it borders with the City of Buenos Aires, to the West with San Martin, to the North with San Isidro and to the East with the "Rio de la Plata" (Silver River). Vicente Lopez has always been a residential area. From the country houses that abounded the area it went to the cute houses that can be seen today. Near the train station (that is around a hundred years old) there are some stores over the Maipu and Libertador Avenues, but residences and Clubs dominate the district. The Ecologic Reserve with a surface area of 3.5 hectares was inaugurated in the year 2000. There the original flora and fauna of the area is preserved. Puerto de Olivos(Olivos Harbour) is the venue for international boat races. In this harbor the "Club de Pesca" (Fishing Club), the "Club Nautico" (Nautical Club), and the Yatch Club of Olivos can be found. Paseo de la Costa (Promenade of the Coast) is a beautiful circuit was inaugurated in 2000, that has an approximate surface area of 44 hectares. It is the largest "Green Area" of Buenos Aires. Here you will be able to find the theater "Presidente Arturo Illia" (President Arturo Illia), the Monument to the end of the Millenium and the "Mirador Arenales" (Arenales Viewpoint). During the weekends an artisan fair is also a popular destination. The Tren de la Costa (Train of the Coast) was inaugurated in 1995 and is the most modern ecologic train in Argentina. Its tracks run a distance of 15.5 KM and it goes through all the bay area from Vicente Lopez to Tigre in less than 30 minutes. The Presidential Country House is the property was once owned by the Azcuenaga family and was donated in 1918 to be used as the summer residence for the President of Argentina. President Jose Felix Uriburu was the first to ever use the property for that purpose, in 1931. The Tower Ader (Tower of Independence) was the viewpoint intended for a castle that was never completed and it is about 42 meters high. It was declared a historical monument in 1996 and is currently used as Vicente Lopez´s Historical Archive. Vicente Lopez Square is the main park of Vicente Lopez. And others, such as Raggio Palace, today a museum and cultural centre, "Parroquia Jesús en el Huerto de los Olivos" (Jesus´s Parish in the Orchard of the Olivetrees), Cine York (York Cinema), today a municipal historical monument, and the Quinta Trabucco.